The first lesson to be learned from this earlier era is that a large middle class requires an economy that generates a broad base of jobs paying middle-class wages. The New Dealers were not opposed to "rigging" the labor and financial markets to achieve this result. New Deal progressives believed the economy should exist to serve society, not the other way around, and that the government has a duty to shape the economy to meet middle-class aspirations. A high-wage, middle-class society would, in turn, be good for the economy: living wages would not only ensure adequate demand for the economy but in so doing would spur new investment and productivity growth, creating a virtuous circle of rising living standards. The belief of New Deal progressives in an economy that could create good middle-class jobs stemmed in part from their resistance to large social welfare subsidies to individuals, on the grounds that this would encourage an unhealthy dependence on the state. Moreover, even though they favored progressive taxation, New Dealers were skeptical of a society dependent upon the permanent redistribution of income. The principal goal of many New Deal programs was not to relieve the conditions of poverty -although they often did so - but to build physical and human capital that would allow people to escape permanently from poverty. Thus New Dealers emphasized government programs that expanded education, spread property ownership, invested in America's common physical and knowledge capital, and seeded the industries of the future. It was not perfect, in large part because it preceded the civil rights revolution and thus left out millions of African-Americans, but it did build the largest and most secure middle class America has ever known. Today we see the consequences of a much different way of thinking about the economy and society. Over the past two decades we have been told that globalization is an immutable force and that we must bend to its demands, embracing the agenda of free trade, financial deregulation and less progressive taxation. The best we can do, we're told, is to let globalization run its course and compensate the losers, even though no amount of new social welfare measures could compensate for the loss of millions of good-paying manufacturing jobs. Thus, without any real debate, America's political elites have chosen for us a highly stratified, low-wage society with great costs to our middle-class way of life and to our productive economy. The second New Deal principle is about achieving a high-wage economy and at the same time more widely distributing the capital and skills for wealth creation. The principal policy tool the earlier generation used was massive public investment and public building. The public investment programs they pursued not only created many new middle-class jobs but also laid the foundation for a more productive economy, which led to even more middle-class jobs. 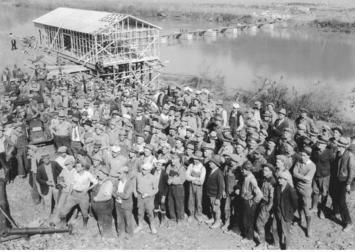 Agencies like the Tennessee Valley Authority in the 1930s and '40s were followed by even more extensive public investment initiatives in the postwar years. From 1950 to 1970, the government spent more than three percent of GDP on public infrastructure alone. It built everything from highways to schools, power systems to parks. Throughout the New Deal era, public investment was America's way of enacting industrial policy. It was understood that public investment paid for itself many times over. The GI Bill alone generated returns of up to $7 for every dollar invested. And because it generated returns to the economy and society, New Dealers in the postwar period were not afraid to raise taxes or to borrow in order to ensure adequate levels of public investment. And borrow they did, even though the national debt was a much larger percentage of GDP than it is now. For the past few decades, however, we have made a very different choice. As concerns over the budget deficit have grown, and as tax-cutting mania has taken hold, we have cut back on public investment. Since 1980 we have devoted less than 2 percent of GDP to public infrastructure and have allowed federal spending on basic research and development to decline as a percentage of GDP as well. As a result, a backlog of public investment needs – clogged roads and ports, collapsing bridges and levees, uneven broadband access, an antiquated air traffic system, an undersized energy infrastructure - has begun to cut into our economic growth and undermine our efficiency. A third principle of middle-class America that the New Deal offers us relates to the concentration of power and capital. Earlier progressive reformers distrusted such concentrations. Not only did they threaten democracy, they also warped the economy and distorted consumption and investment. Government therefore must be a strong countervailing force to big business and oligarchic power, and must be organized so that it cannot be captured by one economic group at the expense of another or the general public. The New Dealers were particularly concerned about the power of Wall Street and the financial community. They feared a national credit system that was dependent on Wall Street bankers, whose interests were not always aligned with the needs of homeowners, farmers and small and medium-sized producers. They therefore sought to democratize capital by creating myriad credit institutions that would ensure that all regions and sectors of the economy had access to capital. They created a variety of federally subsidized credit programs to enable people to construct homes and start businesses and to allow states and municipalities to build schools and modernize infrastructure. It was here that the New Deal was most creative – combining a strong federal state with the local and regional decentralization of capital and the local and regional control of these programs and institutions. As with other first principles of a middle-class America, we have seen a reversal of priorities over the past few decades, as big financial institutions have again asserted their influence over the economy and economic policy. The new power of Wall Street has been evident in its successful push for financial liberalization and deregulation, in the emphasis accorded the deficit and concerns about inflation as opposed to full employment, and until recently in Washington's preference for a strong dollar, which favors financiers over real producers. This triumph of Wall Street over Main Street has been responsible in part for the hollowing out of the tradable-goods sector and for the asset bubbles and predatory lending that have wreaked havoc on the economy. Indeed, one of the first things the New Deal would have us do is re-regulate the financial system and put the interests of the productive economy over those of Wall Street. In all these respects, whether it be high wages, public investment or the decentralization of financial power, the New Deal succeeded because it changed the way the economy worked. And it did so by marrying progressive reforms with Americans' preference for independence, whether from government subsidy or big-business paternalism. This is the enduring lesson of the New Deal. Sherle Schwenninger directs the New America Foundation's Economic Growth Program and the Global Middle Class Initiative. He is also the former director of the Bernard L. Schwartz Fellows Program. Submitted by boothvickie on Tue, 12/10/2013 - 00:09. As with other first principles of a middle-class America, we have seen a reversal of priorities over the past few decades, as big financial institutions have again asserted their influence over the economy and economic policy. Submitted by lizabethfowl on Sat, 12/07/2013 - 03:14. In all these respects, whether it be high wages, public investment or the decentralization of financial power, the New Deal succeeded because it changed the way the economy worked. Submitted by kristinastonestone on Sat, 09/28/2013 - 01:00. "For the past few decades, however, we have made a very different choice. As concerns over the budget deficit have grown, and as tax-cutting mania has taken hold, we have cut back on public investment." what do you mean?